Bant Singh is a lower caste Dalit farmer and singer from the Jhabhar village in Mansa district, Punjab, India, who has emerged as an agricultural labour activist, fighting against the power of the landowner. 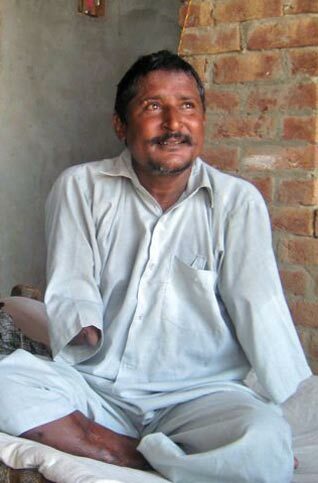 Described by Amit Sengupta as "an icon of Dalit resistance" he has been active in organizing poor, agricultural workers, activism that continues despite a 2006 attack that cost him both of his lower arms and his left leg." After his minor daughter was raped by some powerful men in 2000, he dared take them to court, an unusual occurrence when a Dalit is raped by a non-Dalit, braving threats of violence and attempted bribes. The trial culminated in life sentences for three of the culprits in 2004, "the first time that a Dalit from the region who had complained against upper-caste violence had managed to secure a conviction." On the evening of January 7’2006, Bant Singh was returning home through some wheat fields. He had just been campaigning for a national agricultural labour rally to be held in Andhra Pradesh in January. He was suddenly waylaid by a gang of seven men, suspected to be sent by Jaswant and Niranjan Singh, the current and former headmen of his village who have links with the Indian National Congress party. One of them brandished a revolver to prevent any resistance while the other six set upon him with iron rods and axes beating him to pulp. He was left for dead, and a phone call was made to Beant Singh, a leading man in Jhabhar, to pick up the dead body.However, Bant Singh was alive, though barely. At the Mansa Civil Hospital where Bant Singh was taken soon after the attack Purushottam Goel, the doctor who admitted the patient, demanded a bribe and did not even care to provide treatment for 36 full hours. Bant Singh was bandaged only on the 7th and the next day his attendants were told that the hospital lacked facilities to treat him and so he should be removed to some other hospital. Then he was taken to the PGI at Chandigarh, where both lower arms and one leg had to be amputated since gangrene had set in by then, and his kidneys had collapsed due to blood loss. The doctor was eventually suspended for his conduct. Even now as he lies in a hospital fighting for survival influential upper caste families in his village are threatening all those who are helping him out in his grave crisis. While there are conflicting reports of the Mansa police arresting some of the men who attacked him there is no certainty that they will be ever punished. Bant Singh today works as an activist fighting for the rights of Dalit farmers in his village. He also sings songs of protest, fighting for the rights of oppressed Dalit farmers. “They thought, like many others before me, they could shut me up with their money and power. My daughter’s courage was exemplary. She said that I not only had to stand by her, but also fight with her and we lodged an FIR, with her standing tall and strong with me at the police stations and courts, right till the end,” Bant recalls, with quiet dignity. 1. The Punjab Government make arrangements for best possible medical treatment and artificial limbs for Bant Singh. 2. A high level team of the National Human Rights Commission visit the patient and his village to ascertain facts of the case. 3. The culprits as well as Jaswant and Niranjan Singh be booked under Sec. 307 IPC and Sec. 120B and the SC/ST Act and immediately be arrested. 4. A compensation of Rupees10,00,000 be granted to the family and a permanent attendant be provided to Bant Singh. 5. The wife of Bant Singh be provided with a Government job. 6. Dr. Purushottam Goel be immediately terminated. 7. An Independent National Commission be set up to enquire into atrocities on Dalits in Punjab, in particular those employed as agricultural labour.